More than just improving food access, markets provide significant social capital within neighborhoods and impact residents when they close. This article was produced through a partnership with the New York City Food Policy Center at Hunter College. Victor Papa was born in 1945 on the Lower East Side of Manhattan. “Never left and never will,” said the 71-year-old president of the Two Bridges Neighborhood Council, a community organization that serves the residential, commercial, and cultural life of the southeast edge of Manhattan through community-based programs and strategic partnerships. 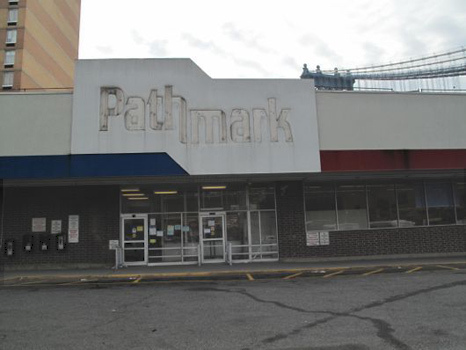 When the large Pathmark grocery store in the shadows of the Manhattan Bridge closed in 2012 after nearly 30 years in business, it made the news. A&P, the company that owned Pathmark, declared bankruptcy and sold its 49 New York City locations that year. Now, the Lower East Side space is on the way to becoming luxury condos after being purchased by the real estate developer Extell. The loss stings like salt in a wound, said Papa. “Our Pathmark was not a homey place. It wasn’t Main Street America. But it was an anchor,” he recalled. The Pathmark was a convenient place to find affordable food, but beyond that it was a place where Papa and other neighborhood residents were guaranteed to see their neighbors. And there was even a bus service to bring people to shop, Papa remembers. Soon after the store closed, the Two Bridges Neighborhood Council went into action by creating a digital guide to local food alternatives and posting information about other places to shop in four languages—so that the mostly-low-income residents could find alternatives. The sociological impact of losing an anchor such as Pathmark often goes beyond food access and measureable data. Especially in urban neighborhoods that have higher-than-average crime or poverty rates, a grocery store can serve as a community center—one that stays open late, generates foot traffic for the surrounding area, and features familiar faces. A number of studies have shown what many of us assume: People will eat more healthy food if they have access to more healthy food. For example, a study from Public Health Nutrition showed that the availability of fresh vegetables positively influences vegetable intake, and an American Journal of Clinical Nutrition study found that low availability of healthy foods was associated with a lower-quality diet. In 2010, based on similar research, the NYC FRESH Program was created to incentivize New York City supermarket owners to build new stores or renovate existing ones in designated underserved communities. While these subsidies were anecdotally shown to promote economic growth and customer satisfaction, it is still unclear whether the new markets have encouraged residents to eat more fruit and vegetables or have led to reduced rates of diet-related illness. However, access may not be a silver bullet after all. And it might be distracting us from some other important variables. Several journal articles have reported that access has little to no impact on healthy food consumption. In 2011, the Archives of Internal Medicine, using 15 years’ worth of data from more than 5,000 people in five cities, found no connection between grocery store access and healthful diets. Additionally, a 2012 study in Social Science and Medicine found no connection between food environment and diet for grade-schoolers. And, in 2014, a case study in Health Affairs found that a Philadelphia grocery store—opened with help from the Fresh Food Financing Initiative—had no significant impact on obesity rates or daily fruit and vegetable consumption in its local area in the first four years after it arrived. The report suggests that when grocery stores are considered the solution to healthy food consumption, neighborhoods are often blamed when they shut down. This implies that the neighborhood itself is at fault for not being able to maintain a grocery store, which neglects the root issues at play—notably poverty, food pricing, and access to transportation. “I’ll be really, really blunt,” said James Johnson-Piett, founder of Urbane Development, a community organization that consulted with the Two Bridges Neighborhood Council after Pathmark closed. “I always felt there was a fatal flaw in just focusing on access.” Having food available in a store nearby may be a piece of the equation, he adds, but it’s not the core issue. But none of this means that communities that lose grocery stores or greenmarkets don’t often suffer a sizable loss. Data and studies may struggle to pinpoint the exact impacts of a supermarket or greenmarket loss (or gain) on a community beyond measurable aspects like employment rates, real estate value, and geographic food accessibility. And it’s important to add that not all stores are created equally. Allison Karpyn, associate director of the Center for Research in Education & Social Policy at the University of Delaware, said the data “obscure some of those less tangible realities and just call a store a store,” citing store cleanliness and customer satisfaction as factors in a grocery stores’ success. Reports that fail to quantify the level of community engagement in a grocery store, or a neighborhood’s sense of identity and pride rooted in the local grocer, may be missing the point. For example, New York City’s 2008 Neighborhood Grocery Store and Supermarket Shortage report, a comprehensive assessment of the City’s need for new neighborhood grocery stores, treats corporate supermarkets as equal to the corner market that greets regulars by name. But, in reality, customers’ levels of engagement in and loyalty to a store often vary greatly based on its size and their relationship to the employees and owner. While community engagement is known to be good for business, as an Initiative for a Competitive Inner City study notes, the effects of that engagement on the community itself are harder to measure. When an established supermarket is replaced with a higher profit potential building—whether a less affordable grocery store or a luxury apartment building—residents find themselves feeling left behind. On paper, the neighborhood might still have access to fresh produce and other groceries, but the psychological impact is also an important part of the equation. We know that New York City is rapidly gentrifying. The median rent is increasing dramatically city-wide: while rents rose by 1.9 percent between 1990 and 2010, between 2010 and 2014 rents rose on average 22 percent, according to the NYU Furman Center, and some neighborhoods saw more than a 78 percent increase in median household rent from 1990 to 2014. With the increase in rent and much higher property taxes often comes the loss of old standby supermarkets, such as the Pathmark, which work on very thin margins. In the last 10 years the city gained approximately 170 supermarkets, however the city lost about 300 greengrocers, or family-owned stores of less than 7,000 square feet, between 2005 and 2015. The arrival of a supermarket or grocery store is also a source of local jobs. A study of a Pennsylvania program that led to the opening of 88 “healthy food stores” showed increases in employment in the surrounding area, “suggesting a positive effect on overall economic activity,” according to a “Health Policy Snapshot” from the Robert Wood Johnson Foundation. Property values within half a mile of the new stores also rose 4 to 7 percent in that Pennsylvania program. In New York City, one of the best examples of community improvement through improved food access is the Union Square Greenmarket, which started in 1976 with just seven farmers selling twice per week. It has grown to a year-round, four days per week, 140-vendor staple that brings in tens of thousands of customers during its busiest times. 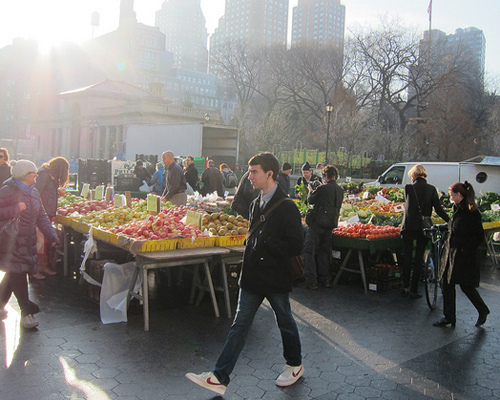 “There is a clear connection between increased real estate values and the opening of supermarkets and greenmarkets in a neighborhood—they signify growth, demonstrate a clear path of investment in a community, and are clear selling points in almost all real estate transactions, commercial and residential,” said John Cella, a New York City real estate agent at Compass. Michael Hurwitz, Director of GrowNYC’s Greenmarket Program, sees first-hand how creating a greenmarket nourishes a neighborhood in multiple ways. Beyond economic and real estate values, Greenmarkets foster positive bonds that may even influence a neighborhood’s safety and reputation. Hurwitz recalls that some of their youth markets, which are farm stands run by youth within their own community, have begun in areas known to experience high crime rates. The same can be applied to grocery stores such as the Lower East Side’s old Pathmark. This is where neighbors meet, where weekly traditions come to fruition, and where familiar faces are found. Even those who don’t purchase their food regularly at a grocery store feel the impact when one closes, as if the neighborhood is going in reverse. Alternatively, when a supermarket or greenmarket opens, it can increase the sense of pride in a community—a step forward.